Who doesn’t love a good webinar? Particularly when it’s free? And about content management systems? And even more, when it’s by one of our awesome columnists, Carrie Hane? One of the biggest benefits of implementing a content management system (CMS) is the sustainability and scalability it can afford its content authors…when it’s implemented thoughtfully, of course. Content strategists are invaluable team members when planning and designing a CMS, as they make sure developers aren’t left guessing about how content is structured and published. Coming up on January 26th, UX Booth Columnist Carrie Hane will be leading a 1-hour webinar about content management best practices. And she’s certainly an expert, as demonstrated in some of her recent posts on content types and content modeling, as well as strategies for content collaboration. 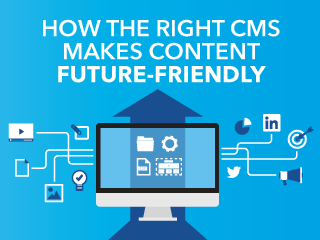 Her webinar is aptly named “How the Right CMS Makes Content Future-Friendly” and will accessible to UX designers, project managers, and content strategists of all skill levels. With so much information being published, so many devices to display it on, and design trends in constant flux, it can be hard to keep your website in good shape. Not only do you need to deliver content and functionality today, but also when the next disruptive technology comes along. How to keep up, let alone get ahead? The answer lies in future-friendly content, which is stored, structured, and connected outside any user interface. A CMS that uses a structured-content approach is necessary to re-use, re-mix, and re-style content for omnichannel publishing. In this webinar, Carrie Hane, Principal Strategist of Tanzen, will show how subject domain modeling combined with content modeling sets the stage for a cross-discipline, content-centric implementation process. Instead of developers guessing what content types are needed to support the content, specifications are developed collaboratively. The result is a faster build and easier content management. So sign up today and show Carrie some love! We’ll see you there!